SXSW is next week — let’s jump straight in! This week the SXSW Music Festival announced two excellent lineups for the SXSW Outdoor Stage at Lady Bird Lake. Thursday’s show features New York-based electronic rock group X Ambassadors with support from Jamie N Commons, Odette, and VOILÀ, while Saturday’s show features quintessential Austin folk singer Patty Griffin with support from Andrew Bird, Courtney Marie Andrews, and William Tyler. Stay tuned for the final lineup at the Outdoor Stage at Lady Bird Lake. 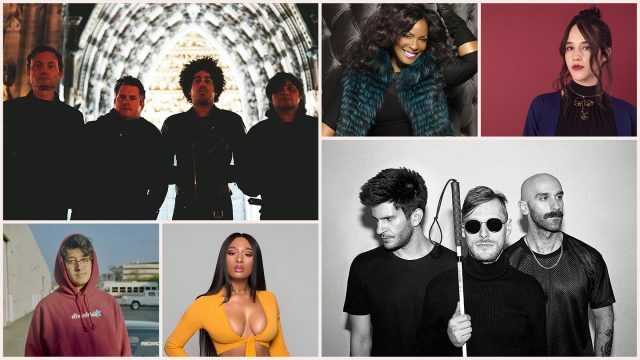 This week we’ve added 180+ Showcasing Artists including R&B and gospel legend Mavis Staples, Californian multi-instrumentalist Cuco, Philadelphia rapper and audiovisual artist Tierra Whack, Mexican DJ collective 3BallMTY, DC “sugar trap” performer Rico Nasty, Brooklyn indie-rockers Charly Bliss, iconic hip-hop group De La Soul, Ghanaian afropop act Stonebwoy, Salt-N-Pepa member DJ Spinderella, Houston rapper Megan Thee Stallion, Mexican actress and pop singer Ximena Sarinana, Dan Auerbach-produced soul singer Yola, and indie-rocker Har Mar Superstar. Yesterday we announced our SXSW Music Opening Party sponsored by Music.com including complimentary beverages and performances by Rico Nasty, Otoboke Beaver, KOKOKO!, Moritz Simon Geist, and Reyna Tropical. We also announced the Tiny Desk Family Hour showcase presented by NPR Music and hosted by Bob Boilen, and while we can’t share the lineup, we guarantee that you won’t want to miss it. Get more familiar with 100+ up-and-coming Showcasing Artists featured in our Music Preview Guide to SXSW 2019 which includes write-ups from trusted authorities on the next generation of musical talent. SXSW is around the corner! Register to attend SXSW 2019 soon and start planning out how you’ll spend your time in Austin. Book your accommodations through SXSW Housing & Travel and you’ll save compared to direct bookings and online travel agencies. Sign up for SXSW Event Updates and follow us on social media to stay in the know – Twitter, Facebook, and Instagram.